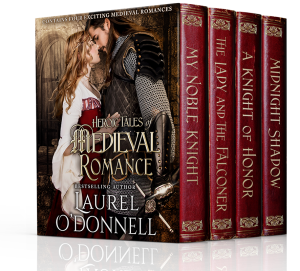 For this week’s Medieval Romance Monday we are featuring the boxed set collection of 4 full-length medieval romance novels written by Amazon Best Selling Romance Author Laurel O’Donnell. Heroic Tales of Medieval Romance is available on Amazon now! Raised on the adventurous stories of the Midnight Shadow, Bria Delaney longs to wield a sword and fight against tyranny. When the unjust rules of a neighboring lord terrorize her friends, she dons the mask and cloak of her childhood hero to right the wrongs and save them from oppression. After encountering Lord Knowles, she is stunned to find her fierce attraction to the very enemy she has secretly promised to destroy. Accustomed to victory at tournament, Terran Knowles lives a life of luxury and ease. When he returns home and finds his coin has dwindled, he must turn to an old betrothal and its dowry to keep his coffers full. Adding to his financial woes, a thief known as the Midnight Shadow strikes his land at night, stealing his coin. His intended betrothed is a headstrong, beautiful woman who immediately intrigues him. Torn between the woman he longs to trust and the outlaw he has vowed to hang, Terran vows to find the truth. With her father at war and her stepmother ruling the castle with disinterest, Solace protects her people the best she can. When a neighboring lord lays siege to the castle, a threat on the lady’s life is discovered. She turns to a man she can’t resist, and puts her trust in a stranger who has captured her heart. Will she discover the secret this man holds before it is too late? Taylor Sullivan is a raven-haired hellion fleeing the tragic flames that destroyed her family. She arms herself with a quick sword and a sharp tongue, hiring herself out as a mercenary, willing to do whatever it takes to survive. Slane Donovan is a knight of honor, sworn to uphold his oath and his word. He seeks the woman who wears the Sullivan ring, determined to bring her back to Castle Donovan to fulfill a promise made to his brother. When he finds the fierce young beauty, her sensual innocence inflames his heart, threatening to destroy the very essence of who he is and the vows he has sworn to uphold.